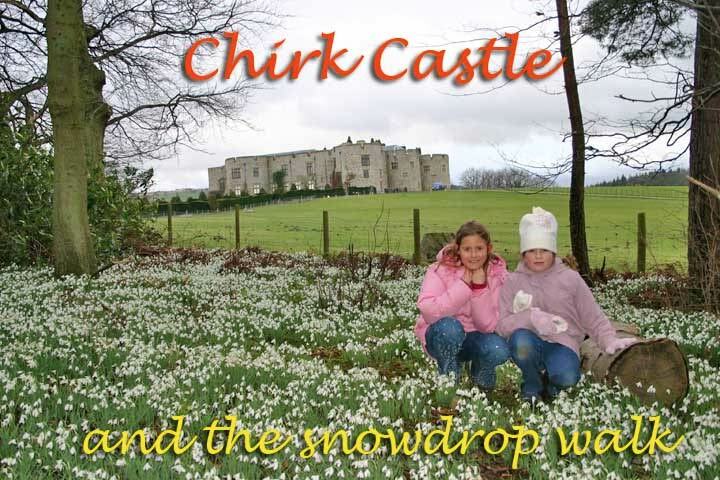 Chirk Castle is an interesting place to visit at any time, but particularly in February when the snowdrops appear in the gardens in their tens of thousands. Carpets of them cover the ground making an exciting sight. Look out for the opening dates/times at weekends during February. The Castle itself dates from 1295 being built by Roger Mortimer, one of a chain of castles to maintain the conquest of Edward I in Wales. Chester was the first of Edwardís main fortresses, and all the others were built with craftsmen including stonemasons, builders, carpenters and labourers coming to the Port of Chester and embarking by ship to the ports of Flint, Conway, Caernarvon and Beaumaris, where they worked on the construction of the castles. The castle at Chirk resembles that of Beaumaris with its strong drum towers giving it great strength. More spacious living quarters were added in the 16thC, based around the courtyard, and these unusually have been occupied continuously since it was built. The ownership of the castle has been in many hands, including the Earl of Arundel, the Stanleyís at the end of the Wars of the Roses, and from 1495 to 1563 by the Tudors, before being purchased by an Elizabethan merchant adventurer Thomas Myddleton. During the Civil War in the 1640ís it was an important base for the Royalist Army, and it was from here that Sir Marmaduke Langdale and men of the Kings Regiments including the Chirk horse, set out for Chester hoping to bring relief to King Charles I, by this time staying within the City walls, but they ìfell upon the enemyî on Rowton Moor, where they were heavily defeated. The Myddleton Family continued in their ownership, and made substantial changes including the building of a long gallery. Further changes were made in 1770,s when Richard Myddleton employed Joseph Turner of Chester to re design the state rooms and staircase in neo classical style. During this same period Robert Townsend of the Old Hall in Christleton, the Recorder of Chester married Anne sister of Richard Myddleton*, presumably to increase his already considerable wealth by a suitable marriage. Robert married three times in all, each time increasing his wealth, and was seen as a grasping and ambitious man who did many things for profit. His daughter Anne was married to Cecil Forester and their son Lord Forester married the daughter of the Duke of Rutland. Elizabeth his youngest daughter married Thomas Ince who gave up his career in the army, sold his estates, and built a grand house to rival that of his father in law. That house is Christleton Hall now the College of Law. However historical research sometimes throws up a mystery because this marriage* is not recorded on the Myddleton family pedigree at Chirk. A sister named Anne does appear at that time, but died in 1760, but there is a document in the Guest Williams papers which states ìLease and release of deeds of settlement on the marriage of Robert Townsend Recorder of Chester with Miss Anne Myddleton of Chirk 6th September 1763. Includes land in Christleton & Rowton formerly the inheritance of John Witter Gent. It even includes a list of wedding property. So much more research is needed. Chirk Castle is now in the care of the National Trust, and is well worth a visit.